As the eclipse wasn’t set to start until the early hours of the morning, we thought we’d better get as much sleep as we could beforehand. 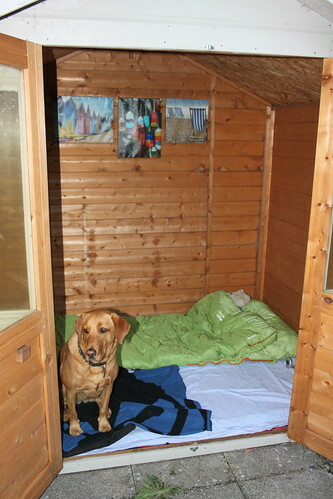 So I dug out a camping mattress, sleeping bag and blankets and made us a little nest in the summerhouse. Molly quickly got the hang of it – once I’d removed her from my sleeping bag. 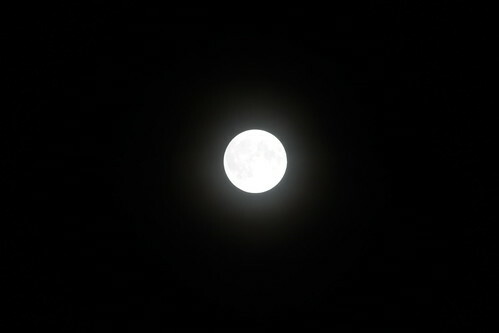 As we went to bed, the full moon was dominating the sky. In fact, the entire garden was lit up in its silvery hue. 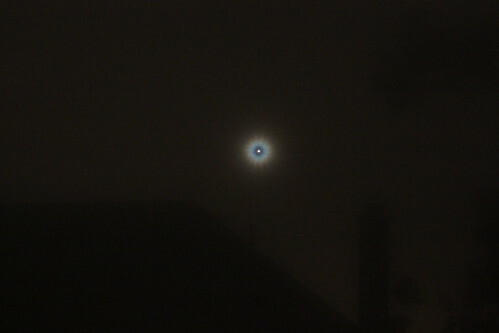 When I peered out at about half past two, the eclipse was well under way. So I took a couple of quick photos and snuggled back into my sleeping bag. 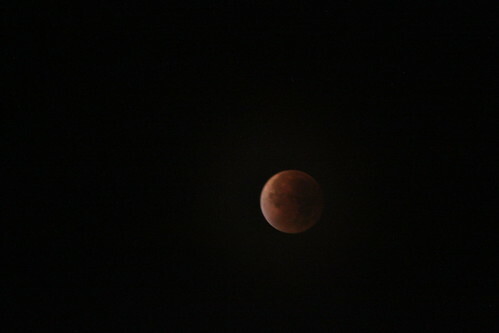 When I dragged myself back out about half an hour later, the eclipse was nearly full. 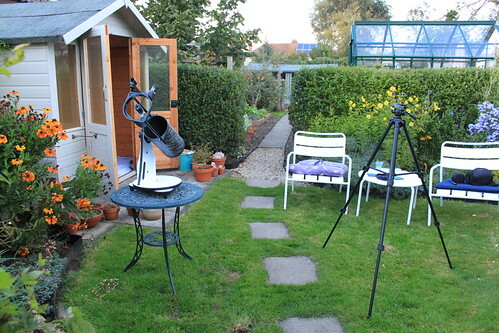 We then entered a prolonged period when the eclipse was complete. 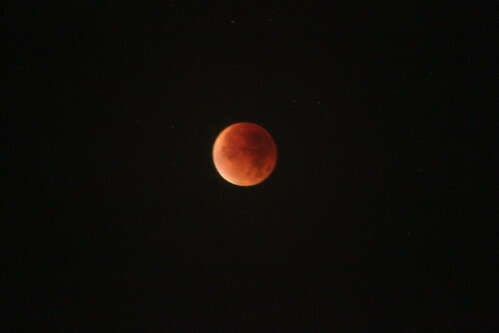 The moon became faint and took on an ominous reddish colour. 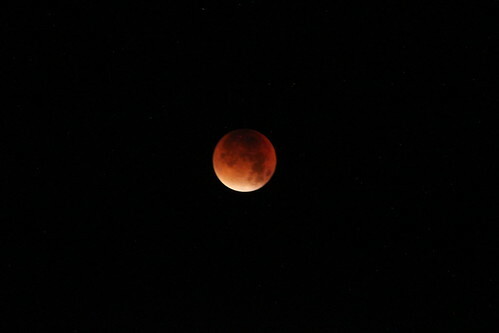 The stars, which had up until now been outshone by the moon itself, appeared in all of their glory. I just sat in my chair, staring up at the sky. For ages. And ages. 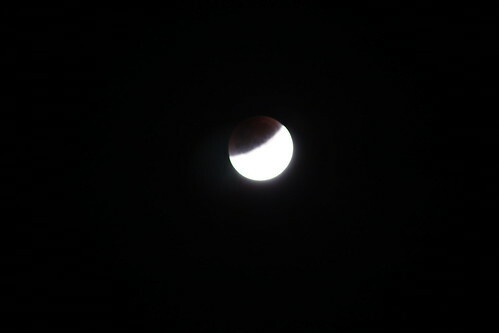 Slowly, the limb of the moon started to become brighter, indicating that the full eclipse was coming to an end. …where I managed to grab an hour and a half’s sleep before the sparrows that live in the garden decided that it was time for me, and everyone else, to rise out of our slumber and get on with the day. Sure, I’m absolutely shattered now. As is Molly, who is lying almost comatose on the sofa behind me as I write this. But what an amazing, unforgettable night. This entry was posted in Astronomy, Photography and tagged Astronomy, Lunar Eclipse, Moon, Photography by Simon Perks. Bookmark the permalink.